Fresno State began its search for our next live mascot, Victor E. Bulldog III, by interviewing several English Bulldog breeders on the west coast. From the moment we talked to Austin Anderson of Hollywood Bulldogs, we knew that they were our choice to be the breeder for this important university ambassador. Austin’s extensive knowledge of the breed, emphasis on breeding for health, and his level of personal involvement in each of his puppies made us feel extremely at ease selecting Hollywood Bulldogs. "We contacted Hollywood bulldogs in Dec of 2010. Austin was VERY helpful in answering ALL our questions we had. He was VERY knowledgeable. This was our 1st time purchasing the bread. Since then we have been customers since April of 2011. We received our 1st female bulldog ROXY then. She was a complete angel & a beautiful girl. Perfect build for a bulldog. Great temperament, wonderful with children. Our kids were 11 & 8 at the time. Got along GREAT with our min pin & boxer, NEVER a problem. Never had a problem with people coming over to the house, always sweet & lovable. 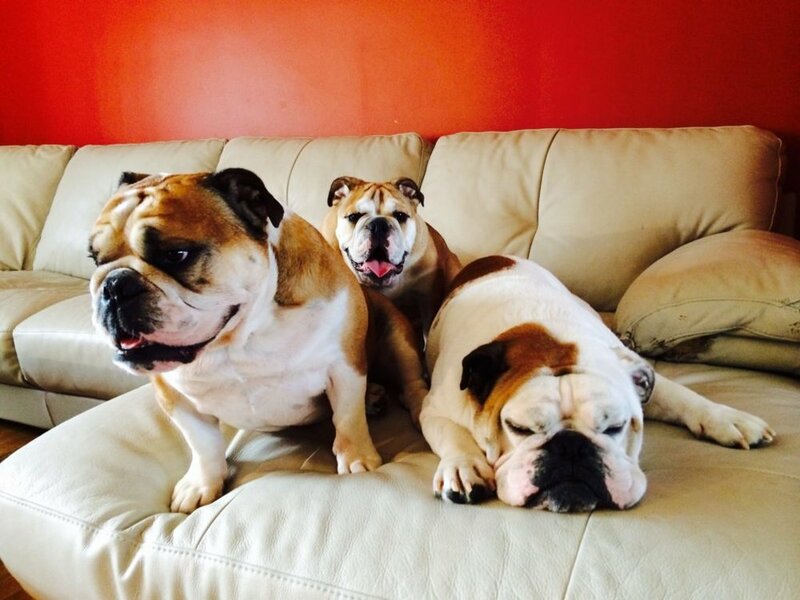 Then in Aug of 2013 we bought another female bulldog Snowflake. She is yet another perfect little angel & a beauty. She loves our boys & both our dogs. She is ROXY’s half sister. She to has a perfect build. Great temperament gets along with anyone who comes over. Never ANY problems. We have been truly blessed with PERFECT breeders & PERFECT bulldogs!!" "My wife Lauren and her mother Hope first met Austin in 2009 at the AKC Meet the Breeds event in NYC. There were no plans whatsoever to purchase a dog but when they saw Austin’s English Bulldog puppies they both knew immediately they weren’t leaving NYC without one. After they spoke with Austin for a while and handled the puppies they knew they had found not only special puppies but a special breeder as well. Our first English Bulldog came home to us that weekend; a female we named Sobe. She is now 5 years old and we have never had any issues health, temperament or otherwise to speak of. She is an incredibly loving and precious animal and loves to lay with us on the couch for hours at a time. When Sobe was 3 we decided we wanted to bring some company into the house for her so we once again reached out to Austin. He was great to work with again for the purchase of our second puppy a male we named Chalky. I have never bonded with another animal more than I have with Chalky. He is the most loving and loyal friend I have ever had. May I say he’s quite the lady’s “man” as well. I regularly hear people tell me that he is one of the nicest looking English Bulldogs they have ever seen and I couldn’t agree more. Much like Sobe he is happy and healthy and just an absolute joy to be in the presence of. He is also very intelligent. When its bath time I say to him “It’s bath time Chalky come on let’s get in the tub.” He runs up the steps, goes into the bathroom and jumps into the tub. Many people don’t believe me when I tell them this until they see it with their own eyes. He has quite frankly melted my heart. "Almost two years ago a small cage with balloons attached to the top arrived at our front door. When the door opened a little white ball with brown spotted ears named Jasper waddled out of the cage and into our hearts. One the way, he peed on the floor just to let us know he was home. And home has never been the same. My son bought Jasper from Hollywood Bulldogs for me as a retirement gift. Jasper is the best gift I have ever received. My wife and I have had dogs of one variety or the other all of our married life and most of our youth. They have all been wonderful dogs and they will all be waiting for us under Rainbow Bridge. But until you have owned a Hollywood Bulldog, you are missing one of life’s special treats. 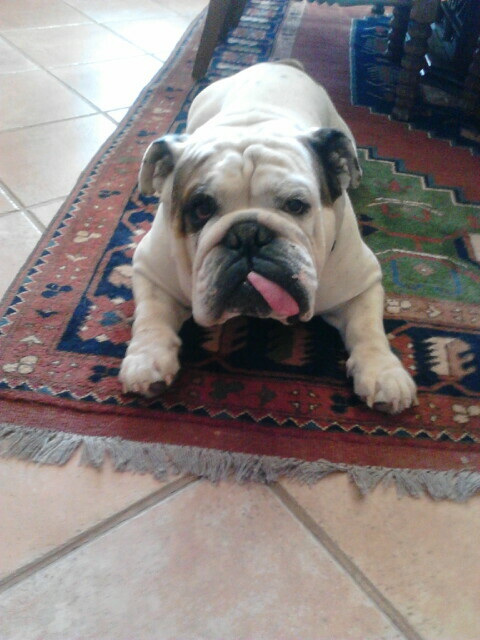 The best thing about purchasing your Bulldog from Hollywood Bulldogs is that you know you are getting a quality animal. Because of unscrupulous breeders and breeding practices the market is flooded with genetically weak Bulldogs. You get your dog home, you fall in love, and then the dog gets sick, or goes blind, or dies.